HTLit returns from conference season with this takeaway: there is a lot of work to be done out there. A common theme that I heard at the conferences I attended and followed on Twitter last month (which covered many overlapping, if distinct, disciplines) was that there’s nowhere to publish and that nobody appreciates what we’re doing. People say they want to write criticism, to write papers, to write fiction and make art, to do science, but there’s no audience, there’s no outlet, no money, and we haven’t yet tapped into some huge pool of readers that would surely appreciate this work if only we could find them. I think most of these are just excuses. We have, at our fingertips, an accessible medium capable of publishing with unprecedented ease. There’s no excuse for a lack of web-criticism. Tales of the deaths of publishers and art galleries have been greatly exaggerated. And that mysterious audience? Despite the arguments that no one reads anymore, a ride on the subway suggests that more people are reading on their tablets and smart phones than was the case even 2 years ago. There will always be a market for stories and art. Perhaps eLit hasn’t tapped into our magical fanbase because either we’re restricting the definition of eLit too narrowly and not acknowledging the fanbase we already have, or because we aren’t making the work accessible enough; the debate over our audience is a discussion for another post. As for publishing our research, it’s true that eLit doesn’t have an established journal, and perhaps it’s time to start one. This mostly comes down to an institutional problem of research metrics, but argument for research blogging notwithstanding, several other disciplines are sufficiently related that their journals welcome our work. And while we’re looking at those fields, let’s invite them into the discussion. 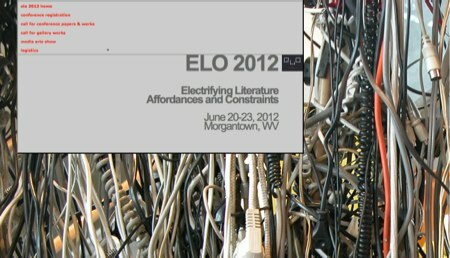 ELO could certainly have benefitted from more computer scientists, librarians, web researchers, and publishers; and the Hypertext and Narrative workshop at Hypertext 2012 would have loved to hear from more artists and creators. These conferences once had the same audience; perhaps it’s time to reconsider over-specialization. I urge the field to simply write. Create. Read, explore, critique. Do the work. If you’re not sure where to submit it, ask. 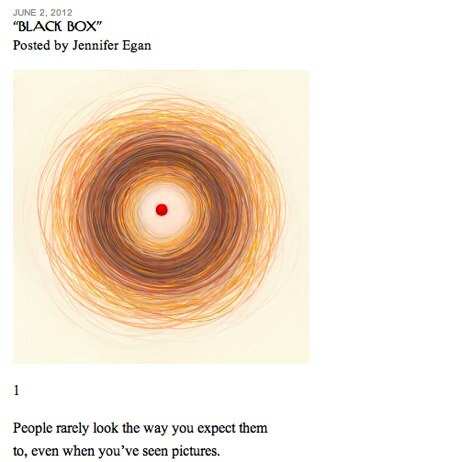 Jennifer Egan (A Visit From The Goon Squad) contributes a short story, “Black Box”, to the inaugural science fiction issue of The New Yorker. The story is designed to be read through Twitter, and is very, very good. 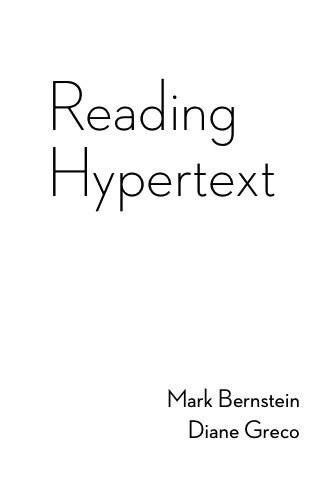 In getting ready for my upcoming talk on agency and narrative immersion at ELO 2012, I’ve been reviewing some of hypertext’s seminal texts and taking notes in Tinderbox. It’s a much slower reading process—which is good, even if I occasionally get impatient with the pace—but I have amazing notes to show for it at the end. These aren’t just mind maps; they are searchable, mine-able, and links (within and among text sources) can be implicit or explicit. Logical fallacies are easy to spot, and counter-arguments are easy to produce. All notes from text sources include page numbers (and a handy agent reminds me to include them if I forget). Figures from the texts can be easily added as image adornments with notes close-by to explain them. 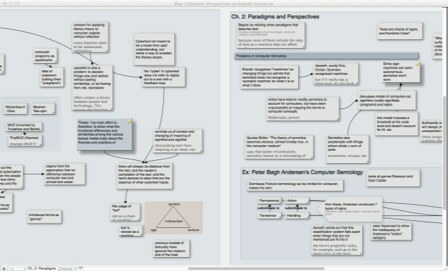 I don’t know how I got through undergrad without Tinderbox. HTLit will soon be traveling to back-to-back conferences to attend the Electronic Literature Organization’s biannual conference in Morgantown, WV, followed by a quick turn-around to the Narrative and Hypertext Workshop at Hypertext 2012 in Milwaukee. ELO promises a packed schedule, and several parallel sessions mean we’ll have to miss some things we want to see. Still, we hope to see some interesting works at the several performances scheduled throughout the weekend, and to return with much to report. The field of literary study is in a state of permanent civil war with regard to what constitutes its valid objects. What right have we to export this war to foreign continents? 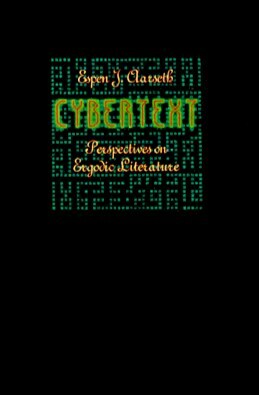 Even if important insights can be gained from the study of extraliterary phenomena with the instruments of literary theory (cautiously used), it does not follow that these phenomena are literature and should be judged with literary criteria or that the field of literature should be expanded to include them. In my view, there is nothing to be gained from this sort of theoretical imperialism, but much to lose: discussions of the “literariness” of this or that verbal medium are ever in danger of deteriorating into a battle of apologetic claims and chauvinistic counterclaims. When much energy is spent on showing that P is a perfectly deserving type of Q, the more fundamental question of what P is will often be neglected. These nonproductive (and nonacademic) campaigns in favor of marginal media or aesthetic forms of expression are pathetic signs of a larger problem, however: they illustrate only too well the partial and conservative state of the human sciences, in which nothing can be studied that is not already within a field; in which the type rather than the individual qualities of an object determines its value as an accepted member of some canon or other. 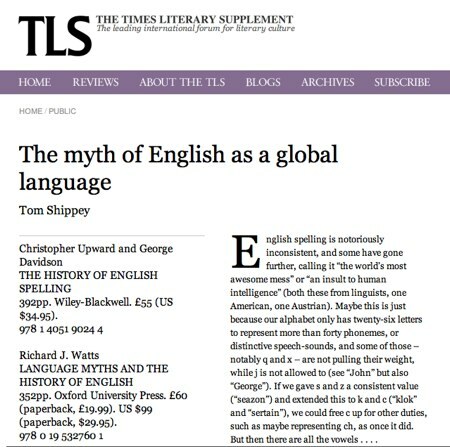 In “The Myth of English as a Global Language,” Tom Shippey traces the origin of common myths and pernicious metaphors of the evolution of the English language, many of which can be traced to nationalism, classism, and mistranslations over the centuries. The dangerous one as regards English, I would suggest, is language as threatened female, whose “purity” is continually being “violated” or “polluted” by vulgarisms, Americanisms, anything one doesn’t happen to like. If one pursued this image, one would have to say that English, far from being a pure maiden, looks like a woman who has appeared out of some distant fen, had more partners than Moll Flanders, learned a lot in the process, and is now running a house of negotiable affection near an international airport. But metaphors can be taken too far. The witty piece offers sound arguments on why our language has evolved as it has, and how its continuing evolution affects our social structure. The real and serious issue must be the use of Standard English, and Standard American, to “strengthen social elitism and exclusion” in the present time, and here there are two views. To speak personally, I was once present at a lecture urging the use of “Ebonics” (African American Vernacular English) as a teaching medium in predominantly black American schools. At the end of the lecture an African American stood up and said, in Standard American, that he was a lawyer specializing in defending African Americans in the courts; and that if he did this in AAVE rather than Standard American, his acquittal rate would be much lower. So, stick to one’s principles, and see young men sent to jail? Lament the prejudice which creates such a situation, and do nothing? Or accept bidialectalism? It’s easy for linguists – writing, of course, in perfect Standard English, or else they wouldn’t get published – to take the high moral line.